We all love our trusty ol’ coffee pots that churn out multiple cups of joe to get us all jittery and ready for the day, right? And we can all agree that single-serve coffee makers are the single greatest thing to happen to humanity since the discovery of Arabica itself. But what if there was a way to combine these two and potentially create the brewer of every coffee lover’s dreams? 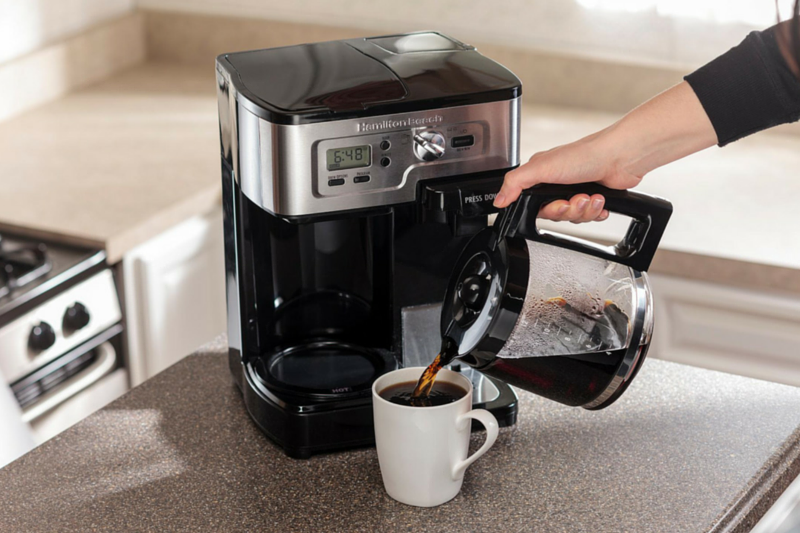 Well, Hamilton Beach has tried their hand at this and came up with the 2-way Flexbrew Coffee Maker! This $169.99 Machine is built to be as versatile as they come, with the ability to brew either a full carafe or a single cup of java. To brew using either ground coffee or K-cups. Does it all sound too good to be true? Let’s dive into this Hamilton Beach 2-Way FlexBrew Coffee Maker Review and find out if these guys are messing with us. The first time you lay your eyes on this coffee machine, you immediately know there is something different about it. To its left sits a 12-cup glass carafe atop a warmer, and to the right is the single-serve side, which can accommodate a standard cup or travel mug thanks to the adjustable cup rest. While it does have some stainless steel accents around the control panel, majority of it is made out of plastic. It might not feel as sturdily built as other machines, but considering it costs under 100 bucks, this isn’t much of a deal breaker. It’s pretty space conscious too! The unit has a width of 10.8 inches, a depth of 11.8 inches, and a height of 15.8 inches. It’s really not what you’d call small, but it doesn’t need you to renovate your entire kitchen just to accommodate it (we’re looking at you Jura!). The control panel at the front is very straight-forward. 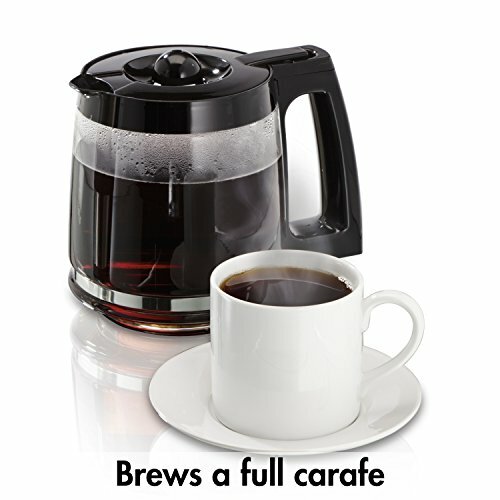 It has a knob that allows you to select between the full carafe and single-serve functions. And a couple of buttons to set the timer, cycle between operating modes, and start the brewing process. Thanks for looking out for newbies Hamilton Beach. After you’ve decided whether the occasion calls for a single cup of joe or 12 cups of caffeine heaven, everything is smooth sailing from there. At the top of the left side of the machine, you’ll find the filter basket chamber that accepts flat-bottomed filters. All you need to do is fill this with your favorite ground coffee, ensure the water reservoir is full, press the start button, and boom! You’re in business. The carafe can hold 4-12 cups of coffee. And by 'cups’ we mean those teenie weenie ones that love mocking your taste buds every single morning. The impatient ones among us will love the 'pause & serve’ functionality, which allows you to sample some of that delicious elixir in the middle of the brewing process. When using the carafe setting, you can hit the 'Brew Options’ button, just below the LCD screen, and pick between regular or bold brew strength. Now, this is what makes the FlexBrew coffee maker really exciting. The single-serve side of things offers you not one, not two, but three brew options! You can choose to use either ground coffee, coffee pods, or those K-cups that you have been dying to try out. The slide-out compartment on the right side is designed to use one of two inserts: one that will hold your ground coffee and another for the pods. When using K-Cups, be sure to depress the part labeled 'press down’. This ensures the pod is properly pierced, allowing for the brew process to proceed without a hitch. 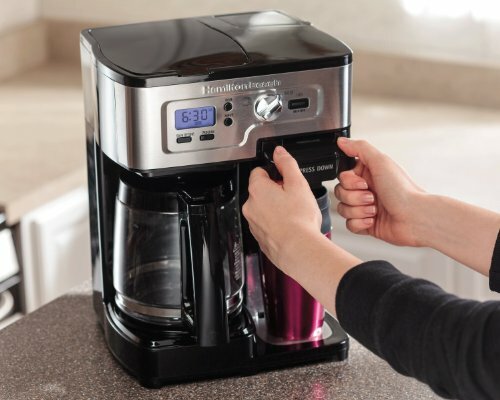 Hamilton Beach has also included little touches that do make those early mornings less stressful. There is a programmable timer, a 2-hour auto shut-off, and get this, a beep that alerts you when your coffee's done. Why did coffee makers ever stop including that! It has also improved on its predecessor by making filling the water tank much easier. The older version came with two sites for doing so: one for the carafe and another for the single-serve. But with the newest model, there is just one opening to cater for the whole machine. PRO TIPS: If you’re a fan of hot cocoa and tea, you can use the single-serve side of the machine to quickly dispense hot water into a cup. When brewing a single cup of coffee, ensure that you’ve filled the water tank to the exact markings shown on the reservoir. Fill it an ounce too much and the machine might simply refuse to brew. This is meant to prevent overflowing and making a mess all over the place. But it can also be a royal pain! The first time you get the machine, you might encounter a plastic-y smell, which can get a bit overwhelming at times. But the bundled user manual explains how to run a cleaning cycle to rid of it. The initial cups of coffee might have a hint of plastic, but it does fade away with time. Most of the components are dishwasher safe, so regular maintenance of the unit isn’t much of a headache. Be sure to thoroughly clean out the piercing needle in the pod compartment to prevent brewing from stalling. Programmable timer and auto shut-off. Viewing window on water tank. Carafe warmer turns on when using the single-serve side. A bit too much plastic in the construction. Hamilton Beach has set out on a path many have feared to take and done quite a good job. 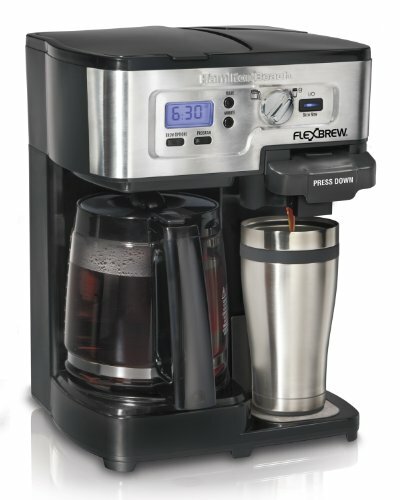 The name itself- FlexBrew Coffee Maker- elicits a sense of versatility. And that’s exactly what this machine is. The ability to brew a full carafe when entertaining and to whip up a single travel mug’s worth of coffee when beating the clock is a quality many will be attracted to. You’ll have to compromise on a couple of things though. 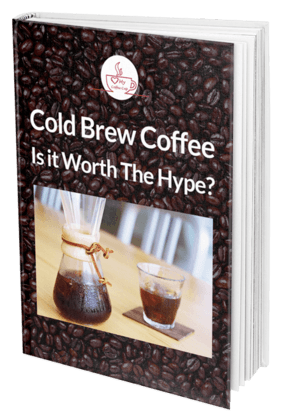 Like premium build quality and sensationally-tasting java. But if convenience and versatility is at the top of your list, then this baby won’t let you down. 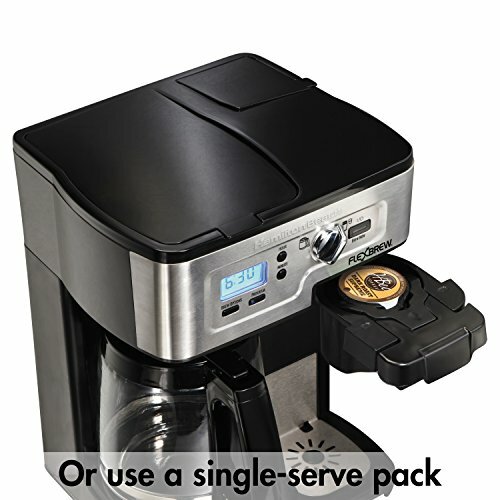 ***Let us know in the comments below, did you find the Hamilton Beach 2-Way FlexBrew Coffee Maker Review useful - would you like us to review a coffee maker of your choosing?